Today has been spent doing little things… waffles for lunch, blogging (yup, you get two for the price of one today! ), a bit of tidying, a bit of shopping, a bit of sewing, and a decision made. Late yesterday, I decided to go out to FabricLand today to pick up some of the heaviest batting I could find. My ironing board desperately needs a new cover. The one that was on it had a hole and each time I’d iron, I’d snag my iron in it. That is no longer the case! I had enough of this blue fabric, and still some left over, to make a new ironing board cover. The up side is that it’s so much more cheerful than the old blue/grey cover that was on it. Ironing might actually be fun now! All in all, from the moment I left the house to the moment I tied the cover to the ironing board, the cover took me about two hours to make. That included driving to the store, poking around, driving home, tracing the ironing board to make the pattern, to cutting everything out and sewing it up and threading a string through the casing! Not bad at all, I think! As I alluded to in the title, I’ve also made a decision. I will be ordering the yarn for John’s new sweater but in the meantime I want something else to work on, something that almost qualifies as instant gratification. 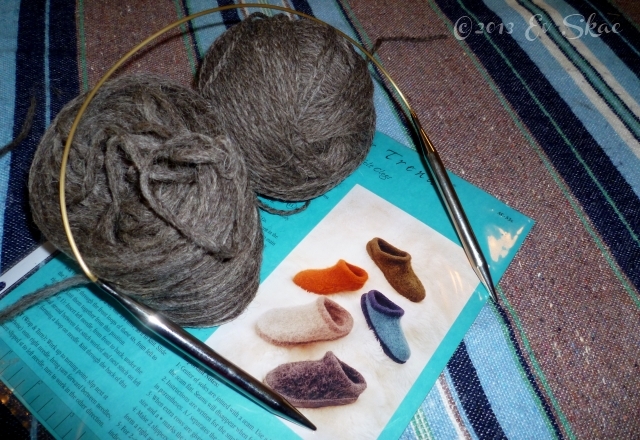 I know what it will be… something that is almost (but not quite) practical knitting. 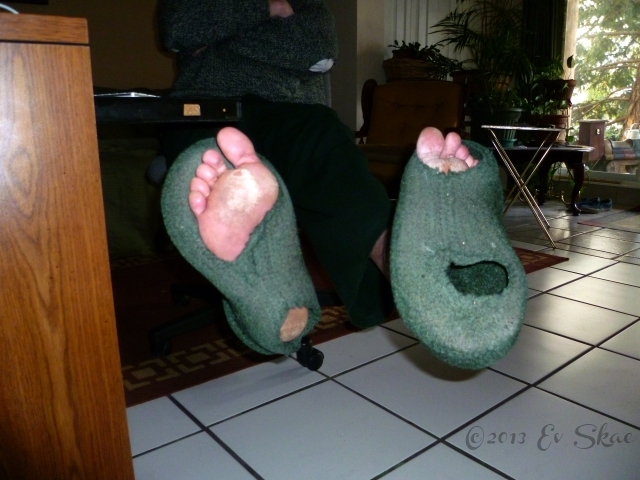 John desperately… and I do mean desperately… needs a new pair of slippers. I made his slippers in October of 2010… two and a half years ago… almost a year ago, I blogged about the fact that both our slippers had started to wear out (I don’t wear mine anymore because of the holes). I guess it’s about time he gets a new pair, wouldn’t you say? You can also see the holes in the elbows of his sweater. It really does look as if I’m being a neglectful wife, doesn’t it? So, yes, slippers are definitely in order! I’ll just go and cast on now.